Pantelleria is an isolated island, alone, in the heart of the Mediterranean, between Sicily and Africa, and it is characterized by its landscapes, where you find natural aspects, elements created artificially, and the characteristic “dammusi”, the Arabian constructions in blocks of lava stone with a domed roof. In one of this “dammusi” we find the comfortable Zubebi Resort, well restored and furnished with elegant simplicity and of great atmosphere, very charming without being pretentious. 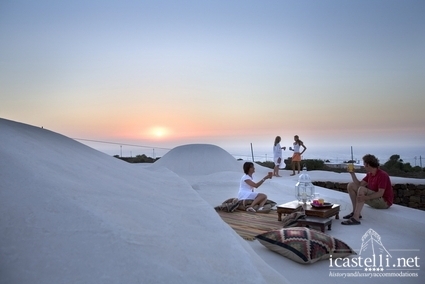 It is an excellent location as a starting point to explore the island, whose cuisine reflects the contributions of different people who ruled the island, such as the Sciakisciuka, a hot vegetable caponata, the Cuccurummà, with tasty local zucchini, the delicate Tumma, the fresh local cheese, the Mustazzola and Sfinci, a kind of pancakes covered with honey. Pantelleria allows you to spend a seaside holiday boating, horseback riding, making gastronimic tours and many other activities, such as kayaking, discovering the southern part of the island which is the most beautiful part of the coast. Here nature has been satisfied with an explosion of colours: the black of volcanic stone, the bright green of the vines, the blue sky and the blue sea water, in a succession of low coasts with smooth stones and cliffs which form, for example, the Mermaids’ cave, while Cala Tramontana and Cala Levante are the most famous places for the tourists. From here you can reach the strong rock formation in the shape of an elephant in the sea, one of the most famous sights of the island, which continues to fascinate the tourists. Pantelleria was chosen to shoot “The Postman” because of its uncontaminated landscapes and because it’s such a unique island, with its characteristic architecture, its houses so different from anywhere else in the Mediterranean, and with its churches and their original architecture and then, as now, it was known as the “navel of the Sicilian channel“,” black pearl “,” turtle “, or” mermaid “, probably because of its shape or, perhaps, because everyone is deeply fascinated. This entry was posted in Italy, Sport and Activities and tagged attività sportive, gastronomic tours, holidays in pantelleria, hotel pantelleria, pantelleria, sea holiday, sport activities, tour gastronomici, vacanze isole sicilia, vacanze mare, vacanze pantelleria. Bookmark the permalink.